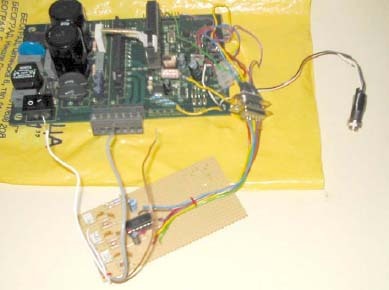 In this paper, written for diploma thesis by Milan Tomić, one brushless DC electromotor control method without position sensors on motor is considered. In first chapter we will be introduced to widely spread brushless DC motors. We will take brief pros and cons analysis of brushless DC drive. Later we will be introduced to the types of position sensing in one brushless DC drive – explicit and implicit. Than we will do thorough analysis of our method. Calculation of components and practical realization of position sensing circuit will be given. For a practical realization of entire system IRDAK 10 motor drive (International rectifier) will be used. It will be analyzed as well as microcontroller PIC16F873 (Microchip) which is the brain of our system. Afterwards, we will take a look at the changes that have to be done on IRDAK in order to connect our position detecting circuit on it. Software resources will be described. Performance analysis will be done. Possible applications and upgrades will be proposed.